Great news! Shutterstock is celebrating the start of 2019 with an exclusive, limited-time offer for all Stock Photo Secrets readers: from now and until April 30th 2019 you will get a great 15% off in your Shutterstock subscriptions using our special coupon code! Make sure to grab this deal before it expires! We recommend you choose a yearly sub to get the lowest possible price and maximize your savings all year round! This exclusive coupon gives you 15% off in your stock footage purchase with video clips packs! Here you can get your hand on these special Shutterstock coupon codes valid through April 30, 2019. Besides Shutterstock royalty free images, we have received a new Coupon for stock video footage too! Make sure you copy the code from the pop-up window before you click on ‘Redeem here'. Use these discount codes now! Shutterstock is well known not only to our regular readers but to the wider stock photo community including creative professionals of different fields. It has over 240 million files to choose from, including royalty-free stock photos, vectors, video footage and audio tracks. Their contributors are great, their image library fantastic with pricing to match. With over a decade of experience in stock photo imagery, of course, Shutterstock is the first place designers, bloggers, and creative professionals go to for quality images. We at Stock Photo Secrets have a very good relationship with this photo agency and have been able to get access to this Shutterstock promotion codes exclusively for our readers. Our long-lasting business relations with Shutterstock enabled us to obtain yet again very good deals for 2019. You can get 15% off with our exclusive Shutterstock coupon codes for stock photo subscription plans and for footage video clips. Shutterstock has multiple subscription offers with monthly download limits. Their annual subscription cuts 20% off the price from month-to-month hiring, so it's a good option if you need stock images all year round. There is a reason why they are in our best stock image subscription list. Shutterstock also uses monthly billing for all their plans, so if you buy an annual subscription, you can pay by the month, not all up front (plus you save 20% with an annual). Here's the pricing page plus you can find some tips here on how to get free Shutterstock images. To say that the Shutterstock stock agency has grown substantially since the foundation in 2003 would be a great understatement. Currently, it holds a staggering library of more than 240 million creative royalty-free stock photos, clipart, illustrations, vector graphics and stunning footage. The success that Shutterstock enjoys in the stock photography industry is largely due to constant innovations in the subscription options available for different needs and budgets as well as their constant reliance on crowd-sourcing from the early years of foundation and their high-quality standards for the technical aspect and commercial value of images. Shutterstock was and is a subscription-based stock photo agency. From the first glance, one would think that this could be a disadvantage but it is not and the catch is in details. 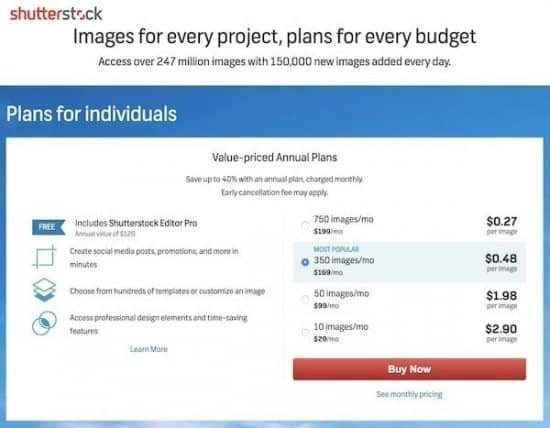 Of course, Shutterstock provides a big subscription plan with 750 downloads a month for big-sale buyers, enabling them to tap into this big treasure chest of graphics goodies for a fraction of a price that is offered by some the competitors ($2388 for 1 year, at $199 per month, which equals just $0.26 per download). 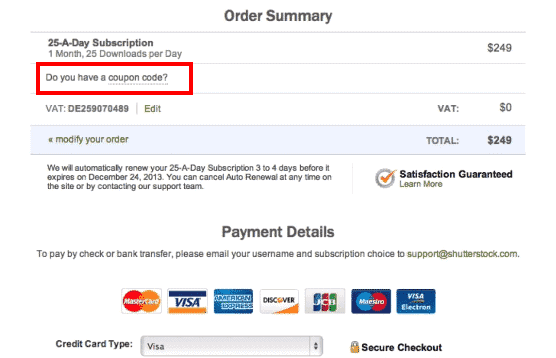 You can save even more with our promo codes! However, if you are not planning to spend much or you just need a few images Shutterstock has you covered as well with special low-volume deals. Their plans start at just 10 images a month, with options for 50 and 350 downloads available too, all priced at much more convenient rates than regular stock photography's. Plus, they also offer prepaid image packs that last for a year, great to accommodate those who need stock images just once or intermittently. This company is quite flexible in providing different customised plans for your needs! Here is a screenshot of the Shutterstock subscription plans and other offers. Our deals are certain to save you some sweet bucks! Let us calculate just how much you can save on each subscription plan using our Shutterstock Coupon Code. Choose which subscription you want, selecting the number of downloads per month and the duration of the plan – We recommend choosing the annual subscription to get the best value for your money! Go back to the pop-up window and copy the exclusive coupon code it shows. Paste it in the code field of the purchase page and click on apply. You will see the discounts in a second ;-). Congratulations! you have saved up to 15% from your Shutterstock subscription. You can start downloading their awesome stock photos and vectors right away. We hope you have enjoyed our exclusive Shutterstock coupon code. What stock image agency are you subscribed to? Are you happy with your current subscription? If you have not tried Shutterstock, you should start using it now. It has a library of creative royalty free images from thousands of contributors worldwide. It secures licenses to protect artists and customers from legal implications. With over 240 million images, illustrations and graphics, it is clearly one of the largest, if not the largest stock photo website in the market. Shutterstock offers affordable premium content. Some photo sites and even some stock photo agencies offer free images. Shutterstock does not. Of course, you can think why to pay in Shutterstock if I can get free images elsewhere. Well, free images tend to be lower quality and present considerable legal risks when used commercially. That is why it is recommended for customers to purchase stock images or subscribe to plans to maximize their experience and optimize the efficiency of their creative projects. While the website offers affordable rates, it will greatly benefit you if you use Shutterstock coupons. 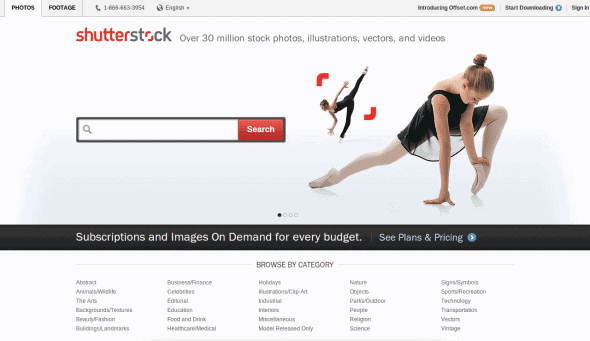 Shutterstock is available in various price rates, allowing you to adjust to your budget. You can purchase an image pack on demand, which is more costly, or you can subscribe to a plan that will let you save up to thousands. It also features an “Enhanced License Subscription” that allows you to access features not available in the standard license. However, subscription in the enhanced version is much more expensive and can be bought on demand only. Shutterstock has numerous admirable features, but the thing we love most about it is its user-friendly interface. It easily caters to users and appeals to visitors as well. Several tabs and navigation links are set in order. It also sports a comfortable look for users. One of the website’s assets is the link to Skillsfeed, which provides a timed offer in design tutorials. In addition, it makes signing up as easy as possible. It has a sign up link, which makes the entire signing process less tedious. Find here how to get Shutterstock free downloads per week. Through these Shutterstock coupons, you can avail up to twenty percent of discounts on all Shutterstock prices. You may think ten percent is not a huge reduction, but it is really matters – most especially if you are planning to make multiple purchases or to subscribe to great plans. Just keep in mind that many pretentious websites scatter all over the Internet, be sure you are dealing reputable ones. You might want to check out our iStockphoto promo code here. Shutterstock on Facebook: They have very inspiring content on Facebook where you'll find a wide selection of sample stock images their trends and many other team and company related topics. Shutterstock on Twitter: If you are looking for visual inspiration – check out their Twitter Profile and recommended content on ShutterStock.com. Also don't forget to follow them to get their free stock photo every week and learn how you can search better in their large database. Shutterstock on Pinterest: The visual social network, aka Pinterest, is there you can connect with Shutterstock with dedicated boards to learn more about their art, images, creative work and of course cat content. Shutterstock on Instagram: The new kid on the block – get inspired by the latest creative and hip stock photography trends from Shutterstock. They post images from their huge database collection of Royalty-Free images and samples of the images they offer. Shutterstock on YouTube: Inside video look for everyone who want to start in stock photography. Get stunned by their breathtaking video clips and footage videos which you can get cheaper with our offer here on that page as well. There is a reason why so many people follow their YoutTube channel. Go and get your subscription as well.